John Boehner has a 2014 commitment to helping Obama with his biggest failed goal of 2013: amnesty for illegals. We think that they need not waste time with ‘hoping’ that this RINO will go right along with Obama and his desire to implode our country…of course he will. The Congressional Budget Office determined the intended immigration reforms would lower the wages of American workers. So goes our country, piece by piece, at the hands of a sociopathic socialist and his minions. House Speaker John Boehner (R-OH) is committed to passing immigration reform, and amnesty advocates are more hopeful that Boehner will ignore conservatives who are opposed to a pathway to citizenship provision that the Congressional Budget Office determined would lower the wages of American workers. On the second day of 2014, the New York Times reports that Boehner’s aides “said this week that he was committed” to legislation on immigration reform in 2014 and helping President Barack Obama achieve what had been his “biggest” goal of 2013. Rep. Paul Ryan (R-WI) is expected to play a big role behind the scenes in passing amnesty, according to the outlet. 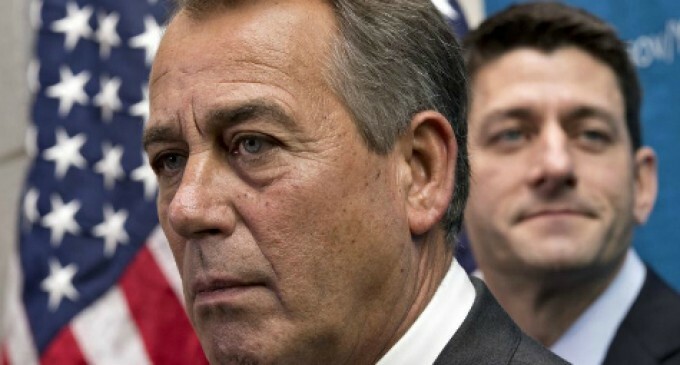 House Republicans indicated to the Times that they would be open to piecemeal legislation, while amnesty supporters said they were hopeful that Boehner would “ignore conservative voices who oppose a path to citizenship.” President Barack Obama and Democrats have said they would be okay with piecemeal legislation only if all of the pieces passed. Boehner and House Republican leaders have said they would not conference with the Senate on the exact Senate bill, but they have left open the possibility of conferencing on various aspects of the legislation. Should that happen, a pathway to citizenship provision would be inserted; Sen. John McCain (R-AZ) has said that needs to be a “fundamental principle” in any agreement, and Obama has said he would not sign a bill without that provision. As for a timetable, the Times reports that amnesty advocates believe the best chance to pass comprehensive immigration reform will be right after the Republican primary season around June, which is consistent with what McCain has said, as Breitbart News reported. If amnesty advocates cannot have a bill by the midterm elections, they could make another push during a lame-duck session of Congress, the Times notes. House Minority Leader Nancy Pelosi (D-CA) has said comprehensive immigration reform will pass before June if it passes at all. Rep. Luis Gutierrez (D-IL), who has called Ryan an “ally” in his quest for amnesty, has said that this year would be comprehensive immigration reform’s last chance, which may explain why, according to the Times, amnesty advocates are planning more acts of civil disobedience and hunger strikes to pressure Congress into ramming the legislation through this year.